The Bulgarian responsible for cracking the latest variants of the Denuvo anti-tamper technology has slammed SEGA for being "anti-consumer". Voksi says that when cracking the protection on Sonic Mania Plus, he noticed that the anti-piracy system hadn't been deployed properly, meaning that even people who buy the game will be negatively affected. Since their aim is to prevent people from copying titles and playing them for free, no anti-piracy technologies are popular with pirates. Underlying this emotion is a kind of unofficial ‘hate-scale,’ in which the level of a dislike for a particular system increases proportionately to its success on the ground. Denuvo, one of the most prominent and difficult to crack anti-piracy technologies, is hated most of all. Denuvo isn’t undefeatable, various groups and individuals have proven that. However, there are persistent claims, denied by its makers, that the technology not only slows down pirates but can also negatively affect the gaming experience of people who actually buy protected games. The latest accusations come from Voksi, a cracker in his early twenties, who recently cracked the latest variant of the anti-tamper technology. Yesterday he released a cracked version of Sonic Mania Plus just a day after release and says SEGA did a poor job of implementing the system. “SEGA rushed to implement the newest Denuvo in the new update of Sonic Mania and did a poor job of it, causing many issues and game slowdowns for legit users,” he informs TF while accusing SEGA of being “anti-consumer”. Those issues, Voksi says, are being reported by users on Steam’s Community forum, who bought the game yet are still experiencing problems. One report, in particular, caught Voksi’s eye. “My game runs slow whenever I enter the Replays menu in time attack mode, and the time attack level select too for some reason, and it continues even after leaving both,” the user in question reports. This problem with Sonic Mania Plus running slowly at this point in the game rang a bell with Voksi. TF asked him to explain what causes the problem and why it’s so serious. “The issue is serious because it directly impacts legit users,” he says. Another Steam user, who complained that he couldn’t get past the game’s menu screen, also sounded familiar to Voksi. He says that he found Denuvo code affecting that part of the game when working on his crack. “One person even couldn’t load the game. It stuck for him in the loading screen right before the menu, which is an anti-tamper trigger I’ve encountered while I was cracking the game, which did exactly the same thing as described. I don’t know what is the reason to trigger for this person on a legit copy, but nothing can surprise me anymore,” he says. While Voksi isn’t sure why Denuvo is acting this way, the solution to the menu screen issue published on Stream forums points the finger at the anti-tamper technology. In a post by Aemony, people with the issue are advised to “remove the offline token for Denuvo”, something that reportedly worked for previous iterations of the game. 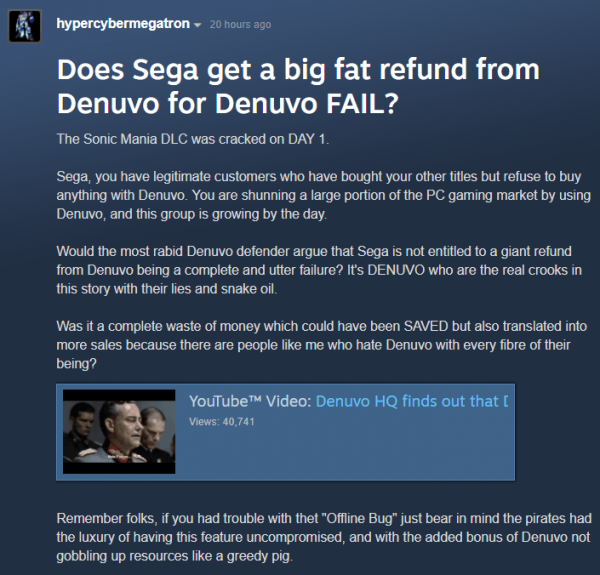 For both Denuvo and SEGA, the situation isn’t particularly good. Eight days ago and just two days after SEGA released Shining Resonance Refrain (also Denuvo-protected), Voksi released a cracked version of the game. He believes the quick turnaround on his part prompted SEGA to rush in to further protect Sonic Mania Plus but without doing the job properly. “The truth is after my Shining Resonance Refrain crack that I did on day 1 (which also had the latest Denuvo), it seems that SEGA got scared. It tried to rush the implementation of an even more bloated variant of the latest Denuvo with all protection features and this is the result,” he says. In common with all previous instances of claims that Denuvo affects legitimate players, it’s likely that those behind the technology will stay silent or insist there isn’t an issue. Nevertheless, long discussions on Steam not only suggest that Denuvo isn’t liked, but is also failing in its mission to protect games for even a short period of time. Earlier this week new research revealed that due to their dislike of Denuvo, pirates are sabotaging reviews of Denuvo-protected games. While this could have some effect on sales, it will take legitimate buyers to vote with their wallets before anything is done about the problem.